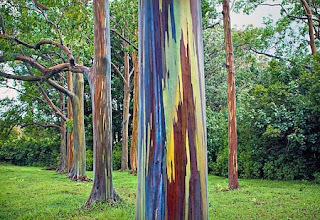 Eucalyptus deglupta is a huge evergreen tree from the seasonally-wet humid tropics. Indigenous to Indonesia, Papua New Guinea and the southern Philippines. It is the world’s fastest-growing forestry tree, but this is not the main particularity. You just have to see the pic to guess what makes it different. Just google it and enjoy.